Floaters are small specks or clouds, often referred to as “cobwebs” in your vision. They are seen more clearly against the blue sky or a white piece of paper. 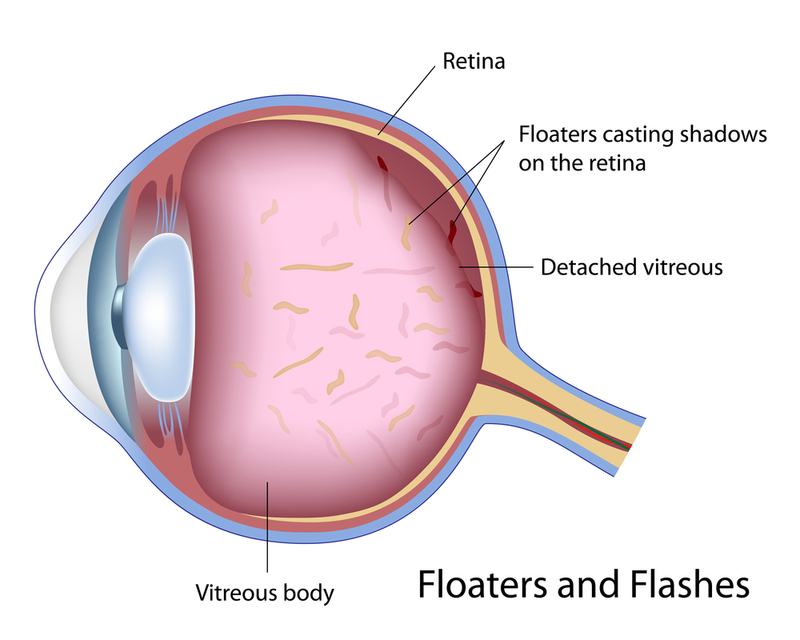 Floaters are composed of tiny clumps of gel from the jelly-like fluid that fill the vitreous, the inside of your eye. These objects are actually floating in your eye and you see the shadow it casts off the retina; hence their name. In some cases you may see flashes of light or streaks of light which happens when the vitreous gel, the floaters, pull on the retina. Often when people “see stars” after being hit in the head, this is the cause. In some cases flashes and floaters can be a sign of trauma and damage to the eye. Contact our Retina Center if you see an increase in flashes and floaters. In these rare cases floaters can cause retinal detachment, a retinal tear, or vitreous hemorrhage.